It's Judy Hopps's first day on the force and while all the big, tough animals get really cool assignments, she gets...meter maid duty. But that doesn't deter this hop-to-it bunny at all. 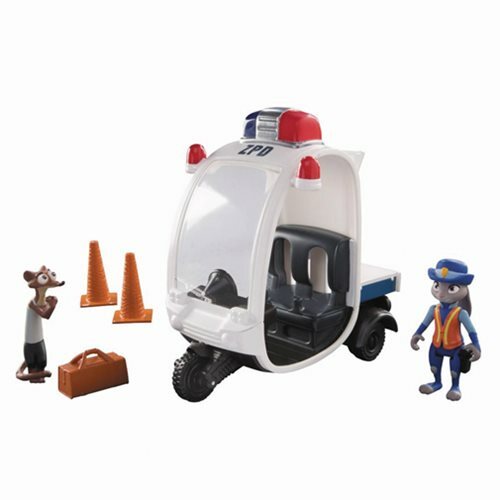 The Zootopia Meter Maid Pursuit Vehicle Mini-Figure Playset includes the Meter Maid Vehicle, 2x traffic cones, a poseable 2 1/2-inch Meter Maid figure, 2-inch tall Duke Weaselton figure, and 1x bag of stolen onions. Pair with your other Zootopia mini-figures to collect the entire herd! Ages 3 and up.